The great holiday drought is finally over friends. The next “new mold” Masterpiece from Takara has arrived – MP27 Masterpiece Ironhide! For many of us, the after-holiday season can seem like the time that true winter sets in. The darkness of night arrives before many of us get off work to go home to our families. The weather is full of rain, sleet, and snow – the grip of the cold winter months is fully upon us. I find as a collector, this is the time I appreciate a new distraction the most. What is more exciting is when that distraction is more substance then what you went in expecting, and that is certainly the case with this particular masterpiece. 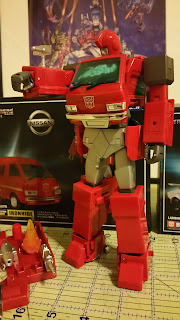 The first fully new mold in Takara’s Transformers Masterpiece line for 2016 is none other than Optimus Prime's right hand robot, the curiously southern slang speaking Ironhide. The figure itself stands as one of the greatest challenges Takara has taken on in its Transformers Masterpiece line to date. This is due largely in fact to the figures origins as a Diaclone piloted mech. 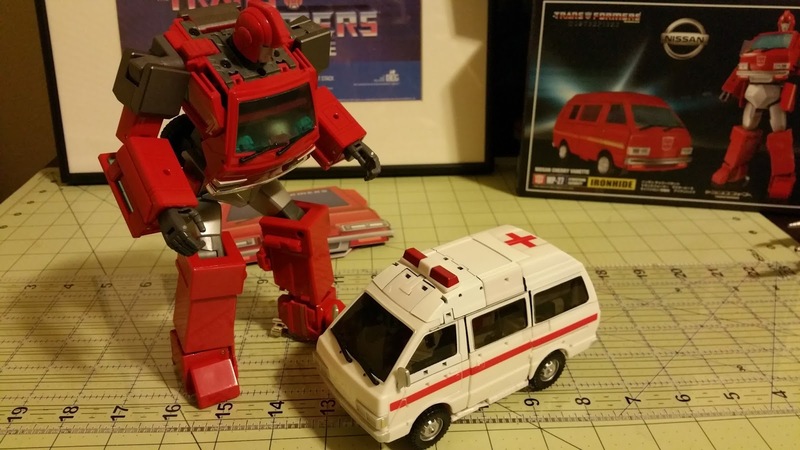 Diaclone was originally a concept in which small humanoid figures would pilot the larger transforming vehicles – the vehicles themselves having no sentience or character in and of themselves. These figures would eventually become the Transformers here in the states. In Ironhides case, due to this play style, the toy wasn't even designed to have a head and instead featured a windowed drivers cab complete with control chair/seat for the pilot (Hasbro would end up putting a “robot face sticker” over the pilots seat to camouflage its original use) and a separate attack sled which was made up of at least half of the vehicle modes remaining mass. 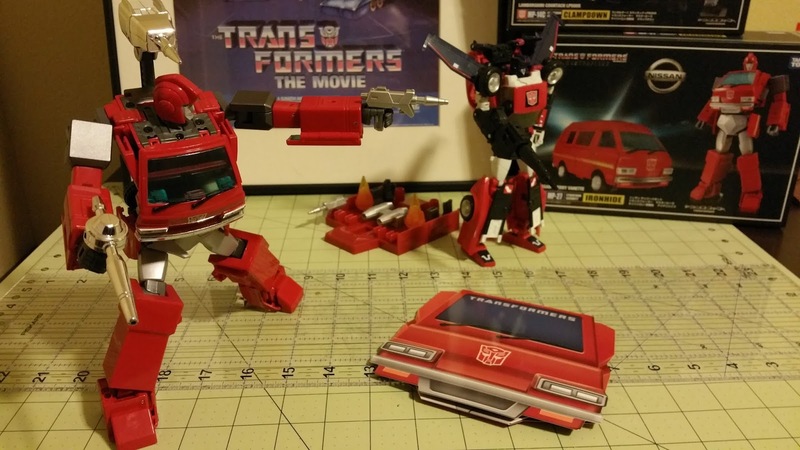 The original G1 cartoon and comics managed to gloss over the fact that the toy Ironhide was based on was a headless/featureless mech by “cheating” and depicting Ironhide with a normal humanoid head/proportions, other features that were never present on the toy, and largely ignoring the existence of the attack sled. From a designer standpoint, this leaves an immediate question. 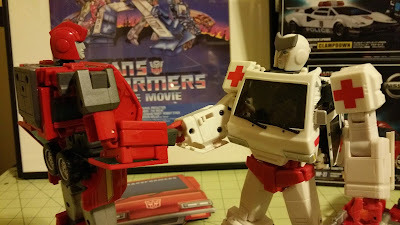 Do you ignore the source G1 toy in favor of trying to emulate what the comic and television animators came up with, do you go for full toy accuracy, or something in between? 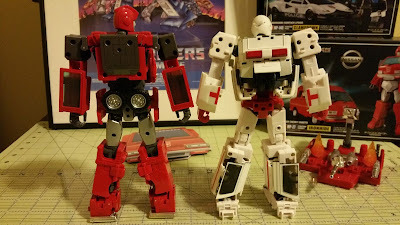 Retaining consistency with the other figures in the line demanded they go for the cartoon appearance of course but the designers did manage to slip in references to his original Diaclone toy origins. 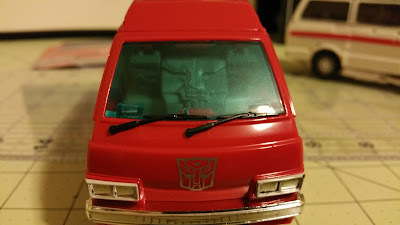 Some of these “easter eggs” consist of including an homage to the Diaclone pilot seat/robot face sticker visible in vehicle mode as well an inclusion of the attack sled as an accessory tray to hold Ironhide’s impressive collection or armaments (though this time the sled is an accessory itself, and not part of the core figure). 80's minivan camper mania is back big time in Ironhide’s vehicle mode, a fully licensed Nissan Cherry Vanette. 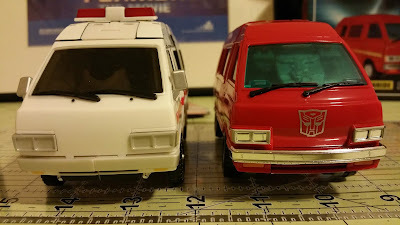 Though there is no Nissan branding on the vehicle, this is actually true to the real world model as the only badging that would be visible is too small to depict in the scale Ironhide represents (a small painted detail on the rear is present where this appears on the real world vehicle model). As continues to be the standard with the more recent masterpiece releases, Ironhide has plastic tires in lieu of rubber as found on the original toy. The vehicle rolls cleanly and does not suffer from any robot kibble to break up the illusion this is simply an 80’s vehicle model (save for some obvious panel lining in places). 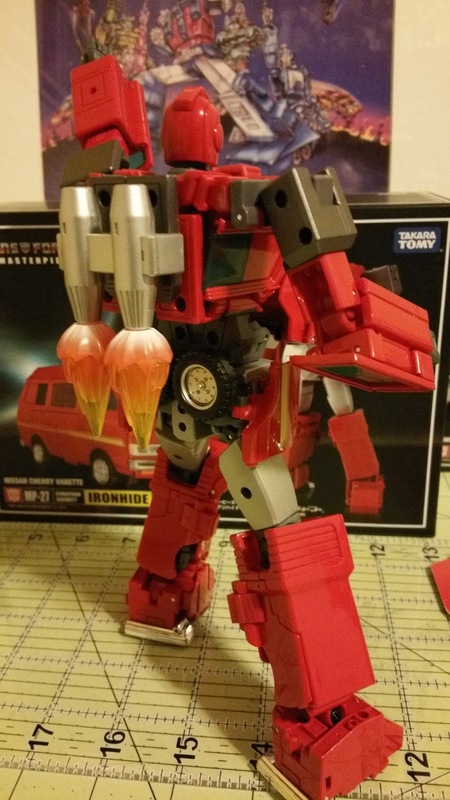 It is also worth noting that two of Ironhide’s weapons (the same basic weapon model was used for MP21 Bumble as well) store nicely on the undercarriage. The transformation from vehicle to robot mode is in keeping with the more “fun” transformations we have seen recently in the MP line, despite the designer of this particular figure being known historically as somewhat over-technical in nature. Each of the steps is intuitive and could probably be worked out without instructions if one was so inclined. 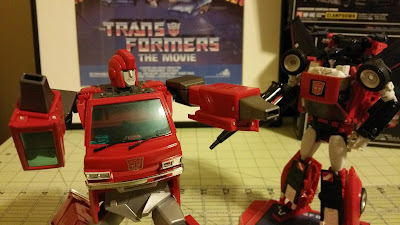 The magic “Masterpiece” moments for me with this figure are the amazing way the sides of the car fold up onto the legs and the clever way both the front and rear of the car fold up together to create Ironhide’s iconic chest window. Everything locks together tightly and cleans up surprisingly well. Some folks will take issue with the decision to include hip panels on the figure (not the first time the designer has done this – MP03 Starscream says hello!) since this feature doesn’t appear on the cartoon or comic model, but in hand this inclusion wasn’t too distracting. Impressively the only real kibble that remains visible in robot-mode that isn’t part of the characters design model are the aforementioned hip panels, two of the tires folding neatly against the characters lower back, and some compacted windows on the back of the forearms. 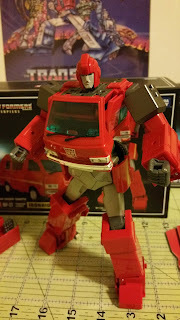 Ironhide manages a rare feat in this line by managing to look fairly clean from the back as well as the front! 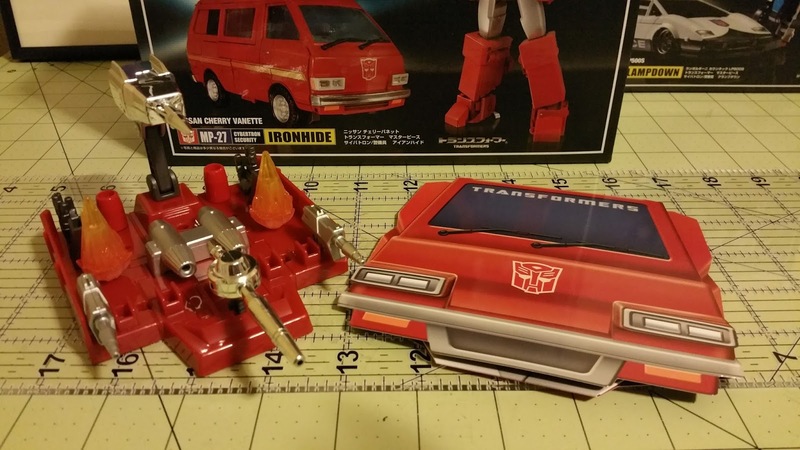 Some impressive compression is represented by Ironhide’s amazing increase in size from his relatively car-bot sized vehicle mode. Small enough in vehicle mode to still fit in Optimus Prime’s trailer, once transformed, Ironhide towers over every other car-bot and stands almost to the top of Optimus chest. 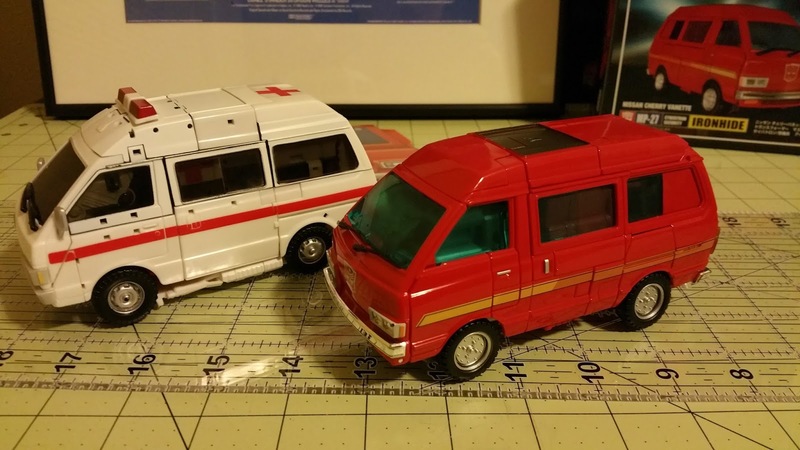 The tight adherence to scale in both modes is an amazing accomplishment by Takara. 2 sets of red spray nozzles. His arm mounted “sonodar” scanner and matching dinosaur fossil display screen to replicate the scene in SOS Dinobots when Ironhide helped locate fossils to create the Dinobots. Now is the part in the review where I try to sell you a toy, be it this one or another. I would be remiss if I didn’t address the petro-rabbit in the room – Voodoo’s own Animus. This isn’t the first time, nor will it be the last, where a critical character in your collection is represent by multiple offerings in the market. Although Voodoo’s Salus (their analog for Ratchet) is the only figure available to purchase today, Animus is just on the horizon who also represents the character of Ironhide. Comparing Salus to the official effort put forward by Takara, is there a clear winner? I think the answer is going to come down to a couple of key strengths each figure has and the base aesthetics that speak to you as a collector. MP27 manages a fairly breezy transformation, amazing adherence to the cartoon source material as far as detailing, and has an amazing array of accessories and call backs to the cartoon while paying for some of these benefits with some additional robot mode kibble and a chest window that maybe is slightly off position from what your memory might recall from the cartoon. Salus greatest strengths probably lay in the designs willingness to break from the cartoon model a bit to produce a leaner robot profile. 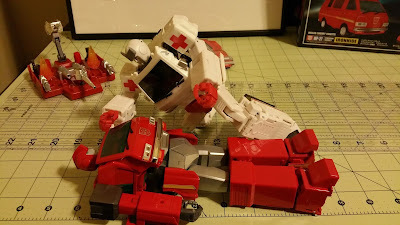 Allowing details such as windows on the feat and rear of the legs help break up the monotony of mono-color that the cartoon model depicted (which some may argue doesn’t translate to appealing on a real-life model) and the chest ending up in a slightly more heroic position than MP27. I would say the transformation complexity and “fiddle factor” is the price paid to achieve some of these more uniform silhouettes by Voodoo. In the end you will need to look at what each company offers and see which one beckons you as a collector. 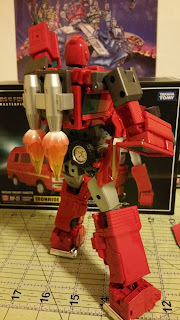 One of the beauties of this figure is knowing the inevitable repaint/remold into Ratchet is right around the corner. Having your cake and eating it too is within your grasp for this character. 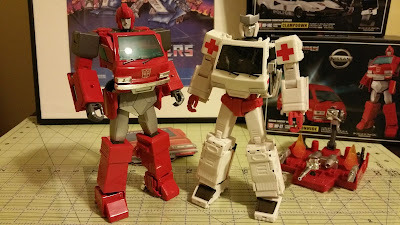 Having MP27 for your Ironhide and Salus to represent Ratchet is an option available to you. Ironhide stands as a reassuring beginning to 2016’s Masterpiece line. With Hotrod and Shockwave just around the corner, I am filled with anticipation that each of the following releases in 2016 will match the quality and fun present in Ironhide. 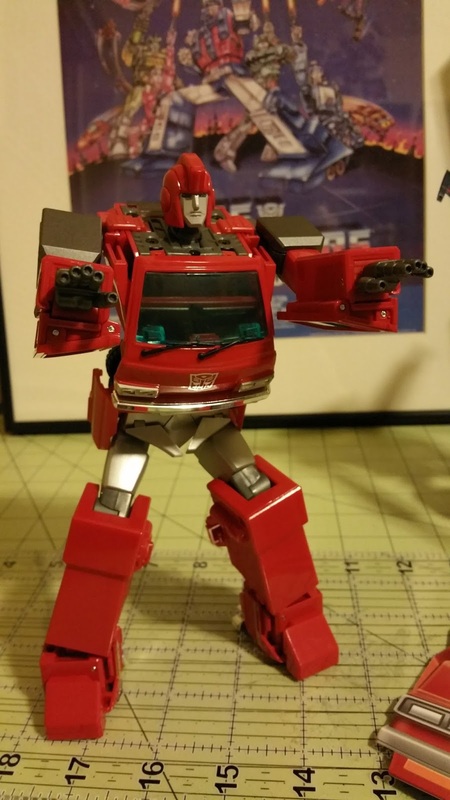 If Ironhide is an indication of the rest of the releases we can expect from Takara this year, we are in for a decepti-chop busting good year indeed! If you haven’t already preordered, you can grab your own edition of Ironhide on our Toy Dojo site here. Also don’t forget to preorder his mold-mate Ratchet here (or the 3rd party version Salus) if you feel the need for some ambulance in your life instead.